For the longest time now, I kept hearing about baked kale chips. I know kale is crazy good for you but getting my kids to eat it...well, that would be a challenge. I did some research online and found out that kale is very high in beta carotene, vitamins K and D, and contain some calcium. It is a powerful antioxidant and is believed to have potent anti-cancer properties. Hello, super food! So in conclusion, I made these "chips" today and was shocked at how tasty they were. Not quite potato-ey, but light and crisp. Best part? My kids devoured them. My son even said he'd like them in his lunchbox. A special thanks to all the fabulous ladies that lead me to this super nutritious snack. I'm so glad I finally tried it! Start by cutting the leaves away from the thick stem part. If you flip the leaves so that the underside is facing you, it's easier to see the stems. Then cut the leaves into 2-3 inch pieces. Rinse and dry the heck out of them. A salad spinner works wonders for this but is not necessary. In a large, dry bowl, toss the kale with the olive oil, enough to lightly coat the kale. 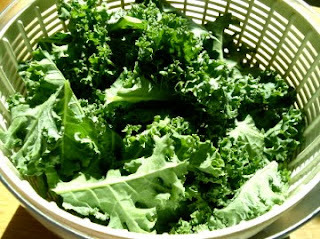 Spread the kale out onto a baking sheet lined with parchment paper or non-stick mat. Do a single layer and try not to overlap the kale. You may have to do two batches. Put them into the oven and bake for 12-15 (or longer!) minutes or until they are crisp but remove right before they start to brown. Cooking time depends on your oven and kale. I made another batch on a different day and it took 20 minutes; you can always check the crispness by carefully touching a piece. Remove from the oven, let cool for a few minutes and then use a turner/spatula to scoop them into a serving dish. Give a light sprinkling of sea salt, a small pinch will do. I *love* kale chips. My recipe includes the juice from 1/2 a lemon, and I think that really brightens them up. My oldest loves the kale chips, too!